The beautiful pristine waters of Puerto Galera, located on the northeastern coast of Mindoro Island in the Philippines, is your more affordable substitute for Boracay Island – where you can also enjoy lots of water sports and activities, nightlife, shopping, dining, as well as discover other natural wonders which your lenses can capture. It takes about 3 hours to go to Puerto Galera from Manila and if you will go there via your own car, just drive through South Luzon Expressway, and then make a right turn to Star toll gate. After that, go straight to Batangas Pier. 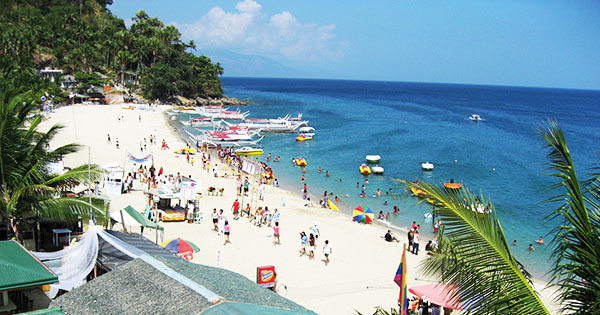 From this point, you may park your car, and then take a ferry that is going to Puerto Galera. Otherwise, you can bring your car by riding a RoRo ship, onto your destination. There are a variety of buses/services to choose from including Jam Transit, BLTB, Sikat tourist service, and several bus/shuttle services from Buendia LRT (Light Rail Transit) station. Many tourists take a bus ride from Jam Transit or BLTB terminals, which can be found along EDSA, in Cubao; as they have hourly trips going to Puerto Galera pier. On the other hand, Sikat tourist service provides only a once-a-day trip, but it is most convenient for those coming from Ermita, Manila. They start leaving Manila at 8:30 a.m. daily from the City State Tower Hotel on Mabini Street. Another route you can take is from Buendia LRT station, where buses or shuttle service can take you to Batangas Pier. Upon reaching this port, just ride a ferry boat going to Sabang, Puerto Galera. Upon getting off from the bus/your car at Batangas Pier, you can take a ferry via either MSL Shipping or Father & Sons. The ferry ride is about 1.5 hours. 2Go Travel can be your ferry ride from Caticlan Port (Boracay), going to Puerto Galera. However, as an alternative, you can avail the huge ferry ride to Roxas, and then from there, take a local jeepney, or rent a van going to Puerto Galera (Sabang Beach).